The possibilities are endless with what you can stuff inside a dumpling wrapper. Pork, Chicken, Beef, Seafood..we've yet to find a combination we didn't like. It's the gift that keeps on giving! 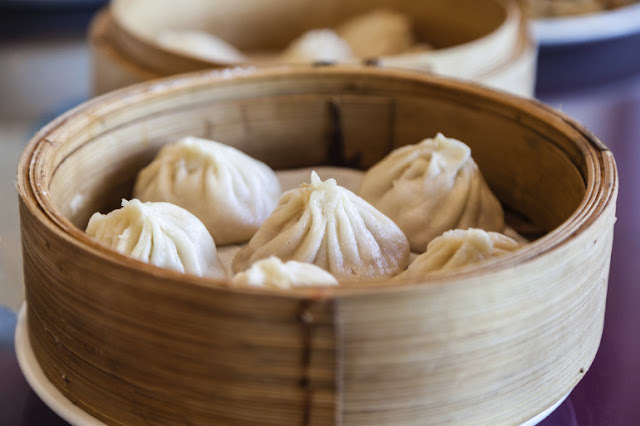 Now you couldn't consider yourself a legitimate dumpling fiend if you haven't tried New Shanghai. New Shanghai is located in Queens Plaza in the Brisbane CBD. It's widely known among Brisbanites as dumpling nirvana. This place has a reputation for dishing out some of Brisbane's most satisfying dumpling creations. Every time we visit, it never fails, there's a line out of the door. The wait isn't too bad, and once you sit down to enjoy your freshly made dumplings you'll realize it was all worth it! One thing we really love about New Shanghai is that you can see the entire dumpling making process from the window outside of the restaurant, from start to finish. We do love a behind the scenes peek! Dumpling Republic is located upstairs in the Wintergarden, Queen Street Mall. The restaurant specializes in fresh, flavoursome, handcrafted dumplings. The menu is extensive and features a variety of different dumplings like: steamed pork and crab, chicken and leek, and waygu beef & onion. Happy Little Dumplings make fresh, nutritious, and delicious dumplings that are guaranteed to put a smile on your face! The restaurant was created by two close friends, who had a desire to fuse Chinese & Japanese staple favourites with a Western twist. What do we love about Happy Little Dumplings? The dumplings are quick and very tasty. Perfect for a fast bite, if you are on the go! Moving outside of the CBD, Little Red Dumpling is a solid option if you find yourself on Brisbane's south side. Located in Pineland Plaza in Sunnybank Hills, Little Red specializes in beautiful, hand crafted fresh dumplings paired with icy cold beer. We have spent many a Saturday night chowing down on their Pan Fried Pork Dumplings, and washing it back with a Tsing Tao! Where's your favourite spot to grab dumplings? Let us know in the comments section!